If a circle has a circumference of 16π, what would its area be if its radius were halved? The circumference of a circle = πd where d = diameter. Therefore, this circle’s diameter must equal 16. Knowing that diameter = 2 times the radius, we can determine that the radius of this circle = 8. Halving the radius would give us a new radius of 4. To find the area of this new circle, use the formula A=πr² where r = radius. Plug in 4 for r. Area will equal 16π. 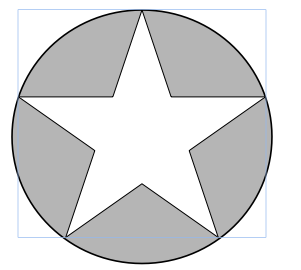 A star is inscribed in a circle with a diameter of 30, given the area of the star is 345, find the area of the shaded region, rounded to one decimal. The diameter of a circle increases by 100 percent. If the original area is 16π, what is the new area of the circle? The original radius would be 4, making the new radius 8 and by the area of a circle (A=π(r)2) the new area would be 64π. A circle with a diameter of 6” sits inside a circle with a radius of 8”. What is the area of the interstitial space between the two circles? The area of the interstitial space = area of the first circle – area of the second circle. If the radius of a circle is tripled, and the new area is 144π what was the diameter of the original circle? The area of a circle is A=πr2. Since the radius was tripled 144π =π(3r)2. Divide by π and then take the square root of both sides of the equal sign to get 12=3r, and then r=4. The diameter (d) is equal to twice the radius so d= 2(4) = 8. If the radius of Circle A is three times the radius of Circle B, what is the ratio of the area of Circle A to the area of Circle B? We know that the equation for the area of a circle is π r2. To solve this problem, we pick radii for Circles A and B, making sure that Circle A’s radius is three times Circle B’s radius, as the problem specifies. Then we will divide the resulting areas of the two circles. For example, if we say that Circle A has radius 6 and Circle B has radius 2, then the ratio of the area of Circle A to B is: (π 62)/(π 22) = 36π/4π. From here, the π's cancel out, leaving 36/4 = 9. A circle is inscribed inside a 10 by 10 square. What is the area of the circle? A square has an area of 1089 in2. If a circle is inscribed within the square, what is its area? A = s2 or 1089 = s2. Taking the square root of both sides, we get: s = 33. Now, based on this, we know that 2r = 33 or r = 16.5. The area of the circle is πr2 or π16.52 = 272.25π. A square has an area of 32 in2. If a circle is inscribed within the square, what is its area? A = s2 or 32 = s2. Taking the square root of both sides, we get: s = √32 = √(25) = 4√2. Now, based on this, we know that 2r = 4√2 or r = 2√2. The area of the circle is πr2 or π(2√2)2 = 4 * 2π = 8π. A manufacturer makes wooden circles out of square blocks of wood. If the wood costs $0.25 per square inch, what is the minimum waste cost possible for cutting a circle with a radius of 44 in.? The smallest block from which a circle could be made would be a square that perfectly matches the diameter of the given circle. (This is presuming we have perfectly calibrated equipment.) Such a square would have dimensions equal to the diameter of the circle, meaning it would have sides of 88 inches for our problem. Its total area would be 88 * 88 or 7744 in2. Now, the waste amount would be the "corners" remaining after the circle was cut. The area of the circle is πr2 or π * 442 = 1936π in2. Therefore, the area remaining would be 7744 – 1936π. The cost of the waste would be 0.25 * (7744 – 1936π). This is not an option for our answers, so let us simplify a bit. We can factor out a common 4 from our subtraction. This would give us: 0.25 * 4 * (1936 – 484π). Since 0.25 is equal to 1/4, 0.25 * 4 = 1. Therefore, our final answer is: 1936 – 484π dollars.